The Egyptian Mau is a breed of cat that at one time was worshipped as deities, protected by laws, cherished as pets, and even mummified and mourned for at their death. This was in ancient Egypt where you can find the history of these cats depicted on the walls in paintings dating back more than 3,000 years. The only difference between the Egyptian Mau’s of today and their ancestors is their origin. The Egyptian Mau’s in North America were imported by the exiled Russian princess, Nathalie Troubetskoy in 1956.This breed is a beauty with striking features that show us the reason the ancient Egyptians fell in love with this cat. The Egyptian Mau is a medium size cat at adulthood. Adult males weigh between 7 and 12 pounds and females weigh between 6 and 8 pounds. 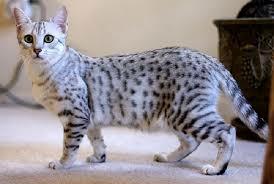 The coat of the Egyptian Mau is fine, short, dense, silky, and resilient. Coat colors can be silver, smoke, or bronze. The forehead is market with the M pattern. This breed of cat does better living indoors, remember their royalty ancestry. They are very intelligent and very loyal. They will follow their family to the deepest jungles and protect them if at all possible. They enjoy being held, sleeping on laps, and doing whatever else the family wants to do. The Egyptian Mau bonds strongly with their human family and are quite shy around strangers. This breed is also a selfish cat and does not want to share his or her toys with anyone. You may hear a growl if you think it is time to put away the toys. They are talkative but they speak with chirp more than a meow. The Egyptian Mau does not necessarily need to be groomed. He/she may like the attention if you wish to brush their coat with fine toothed comb once in a while. The ears will need to be cleaned as well. Diet should be well balance. A few Egyptian Mau’s have allergies to certain foods that may cause hot spots or itchy skin. This breed may have two sets of teeth until the permanent teeth come in and the baby teeth fall out. This can make their mouth very sensitive until the baby teeth fall out. This occurs between four and seven months of age. Life expectancy is 18 to 20 years of age.